Sirana AppAnalyzer for Exchange is a web-based reporting and analysis tool that helps Exchange administrators and IT personnel manage Microsoft Exchange usage. Through a list of pre-defined, automated reports, AppAnalyzer displays usage data about your Exchange servers, including message traffic analysis, message delivery times, historical and current mailbox and public folder storage data, OWA usage, chargeback information and message content analysis. Leveraging the power of Microsoft's SQL Server and SQL Analysis Services, AppAnalyzer provides scalability and flexibility for analyzing and understanding your Exchange infrastructure – without the need to install an additional agent on your Exchange servers. The StealthAUDIT Management Platform (SMP) for Public Folders is a solution providing end-to-end assessment, analysis, and remediation of Public Folder infrastructures. Proven effective in the largest Public Folder environments, SMP's built-in workflow components and business intelligence allow administrators to identify each folder's "Most Probable Owner" and communicate with them to obtain definitive sign-off regarding each folder's fate; in bulk. 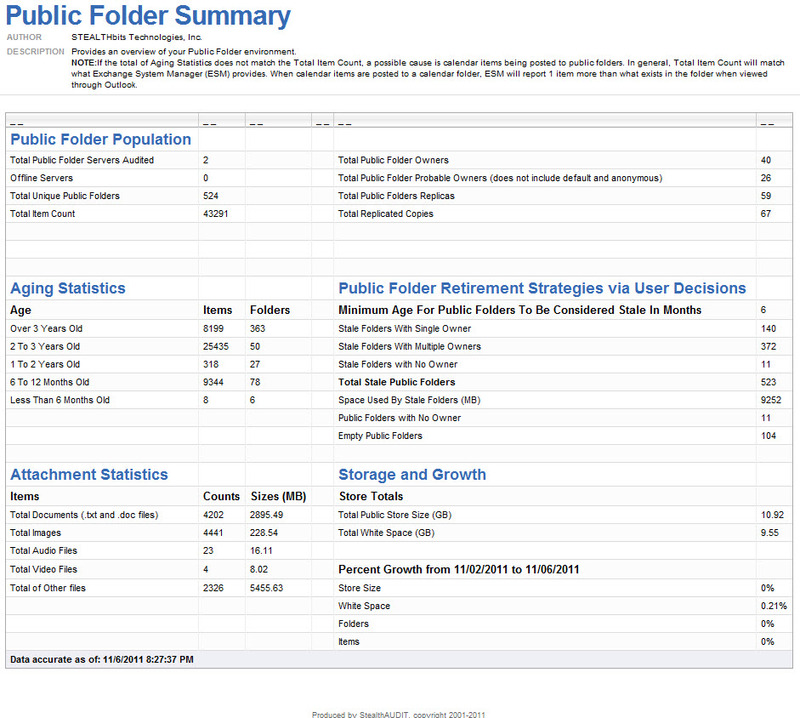 SMP for Public Folders provides the data collection, analysis, remediation, and reporting facilities needed to make Public Folders a thing of the past, opening the door for newer, alternative collaboration technologies such as SharePoint or cleaner, more cost effective cloud migrations. With years of expertise in Public Folder clean-up and millions of folders retired, STEALTHbits is also pleased to offer professional services to streamline and expedite your organization's Public Folder clean-up initiative. The award-winning Permessa Email Control! Express provides dozens of customizable reports for Exchange email tracking, service level management, capacity planning and more. These reports help you identify what is happening within your Microsoft Exchange environment and beyond so you can detect and respond to delivery issues and network bottlenecks before they impact users. It also enables you to understand the actual end-to-end performance of your Microsoft Exchange environment. Key features include: dozens of customizable reports, easy-to-read Exchange log analysis, graphical maps, and automated emails for real-time testing of the Exchange environment. Mail Access Monitor for MS Exchange Server is a software for monitoring the efficiency of your company's mail server usage. With Mail Access Monitor, you can determine which employees most heavily send and receive e-mails, and what data transfer volume they generate by their online activity.